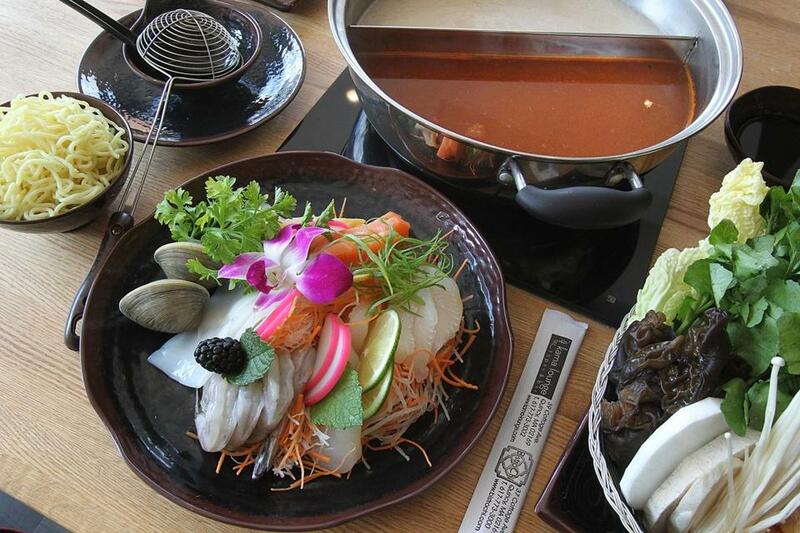 The seafood platter combo hot pot with kimchi broth. At the sleek new Shabu & Mein in East Cambridge, diners pause to admire the fragrant stock simmering in a pot on the table before diving in with skimmers and chopsticks. As hot pot enthusiasts will tell you, the romance is in the broth. The newest outpost of the JP Fuji Group, with eight restaurants in Quincy and Cambridge, and one to come in Somerville, showcases refined bowls of ramen noodles and several styles of hot pot, reflecting a variety of Asian culinary influences. This is communal dining at its best. You and your companions cook thinly sliced seafood, meat, and vegetables, swishing the morsels through bubbling soup on modern induction burners set into every table top. (“Shabu” is Japanese for the sound the food makes as you swish it through the stock.) At the end of cooking, the broth is so flavorful from the swishing, it turns into elixir for you to sip. To make the broth, says Jimmy Liang, owner and president of the restaurant group that he launched with Peter Tse in 1998, stock simmers for almost three days. Kitchen staff used to stay up all night when they were testing early versions of the recipe. Now the broth is prepared in stages so no one works into the wee hours. Pork and chicken bones simmer low and slow before stir-fried aromatics like onions and ginger are added, then the soup cooks hours more. That stock appears in multiple dishes, including ramen for one. 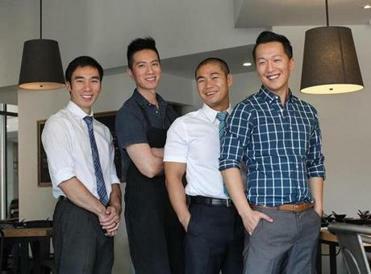 The chef owners (from left) Tony Liang, PeterTse, Jimmy Liang, Ming Cao. Solo dining is a delight at the bar in the back of the airy restaurant. The affable bartender wants to know how you would like the ramen noodles cooked. Choose al dente. Shabu & Mein’s noodles in miso ramen ($14) are thin and delicate, and come fully immersed in that lovely broth, caramel brown in hue, amply enriched with miso, the umami-salty soybean paste. Two thick slices of pork loin, deliciously edged with fat, are set on top along with a medium-soft egg, marinated in sweet soy and sake. We spy one diner snapping pics of her food, making use of an opaque-shaded lamp (one at every bar seat) that bathes the bowl in Instagram-ready light. The hot pot menu, with its mix-and-match ingredients, can be confusing for the novice, so opt for one of the combos, which can satisfy two modest appetites. Each combo includes a choice of steamed white rice or one of five Asian pastas (we adore springy yam noodles), along with a basket of pristinely fresh watercress, Napa cabbage, wood ear mushrooms, speckled taro root, and a blushing wedge of tomato. The seafood platter combo ($22) offers a colorful array of salmon, scallops, squid, shrimp, and slippery, crunchy conch. Rosy curls of beef arrive with the sirloin combo ($18). Lamb or chicken ($14.25 each) or beef tongue ($13) are also on offer in the same format. The regular broth comes with hot pot orders, or you can select a kimchi broth ($3) offering a pleasant buzz of spicy heat, a Thai-inspired tom yum broth ($3), or a vegetarian broth ($3). Tiny dishes of condiments like grainy Chinese barbecue sauce, minced garlic, and hot peppers arrive at the table with every hot pot order. Most ingredients cook quickly, so get into a rhythm, dunking, swishing, and scooping with the long-handled skimmer. Pack some patience when it comes to service in the main dining room. On one visit, the restaurant opened for lunch later than announced, and a staff member was still mopping, so we had to step gingerly over wet floors. That same day, our server appeared so nervous he barely made himself heard over the pop music soundtrack. At the end of the meal, he cleared the table by dumping leftovers, condiments, and dishware into the communal broth pot. Management: Train the staff to show a little more finesse. In the meantime, if someone is mopping when you arrive midday, saunter over to the back bar, order the ramen, and Instagram that softly lit bowl to all your admirers.